Survival along Therk’s seedy coast is precarious. Hounds rule the streets with fear and fists. Former highwaymen now call themselves Merchants. Spices, rare since the desert swallowed the Spice Way, are forbidden to all but the wealthy and powerful. Ethen’s ability to Find lost objects has helped him survive in this world; now, it’s going to make him rich. The Merchant Juddah Luash has offered him a fortune, but not for an object he wants Found. Juddah wants Ethen to Find a person, the escaped slave, Zihariel. To find her brother, sold after the Purge of Calaira, Zihariel has fled her luxurious life as a musician performing for the wealthiest households in the desert. She soon discovers the world is much bigger than she ever suspected, teeming with those who see her only as a pooni, an object to be bought and sold, used until she is used up. Not even her music belongs to her, but to the Dommi-sa who etches his mark onto her skin. From the deserts of Therk to the island of Moscrea and across the Bloodbane Sea, Ethen and Zihariel lie and thieve their way to the great city of Bosbana. There, Ethen’s promised fortune and Zihariel’s greatest performance await – unless they sacrifice all to flee together into the Dragonbacks and become fugitives for the rest of their lives. Library Journal Review for Finder: Dec. 2010. As a Finder, Ethen is able to locate missing things and people. Hired to track down a musically gifted slave girl named Zihariel, Ethen undertakes a journey that leads him first to his target and then to the realization that some things must not be found. DeFino’s first novel creates an exotic desert environment as a backdrop to the story of a young man’s coming-of-age and a young woman’s search for the only family she has left. 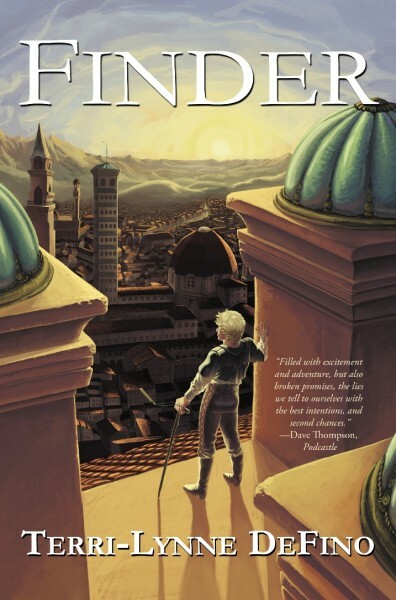 VERDICT Compelling characters and a fascinating world background make this a good addition to most fantasy collections. 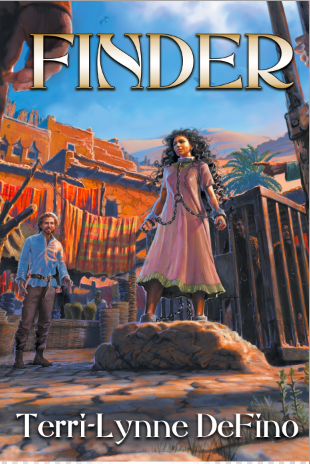 Sneak peek at new cover art for Finder!